Whisk together all of the Balsamic Marinade ingredients in a medium bowl. Remove 1 tablespoon and add to a large bowl along with tomatoes and asparagus. Toss evenly to coat. Refrigerate. Add remaining marinade to a large Ziploc bag along with chicken. Marinate 30 minutes up to 4 hours. When ready to grill, let chicken sit at room temperature for 15-30 minutes (time permitting). Meanwhile, grease and preheat the grill to medium heat, 375-450°F. Grill chicken undisturbed for 5-7 minutes per side, or until chicken is cooked through. (An inserted thermometer should read 165 degrees F.) Remove chicken from grill and let rest 5 minutes before slicing. Grease grill and turn to high heat. Grill asparagus for 2 minutes per side or to desired tenderness. Let cool then cut on diagonal into 1-2-inch pieces. To make the Balsamic Reduction Dressing, bring balsamic vinegar to a boil in a small saucepan, then reduce the heat to a simmer, stirring often. Cook until reduced in volume by half, about 8 minutes and just thick enough to coat the back of a spoon. Whisk in remaining dressing ingredients, adding additional milk a teaspoon at a time iif desired for a thinner dressing. 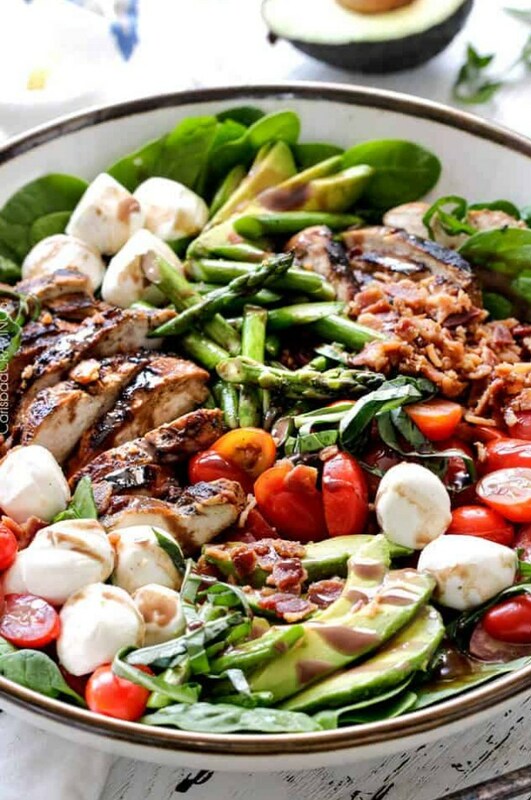 Toss spinach, basil, asparagus, tomatoes and mozzarella in a large bowl. Top with chicken, bacon, and avocado. Drizzle individual servings with Balsamic Reduction Dressing.